Welcome to my lecture at the Frunze Military Academy. You may know me from the Firestorm Campaign, where my record is 18 wins 9 losses 2 draws. So you can say that I know a thing or two about how to fight with the Soviet Army! Some of you have been struggling to make the most of your army and this is understandable and the reason why I am here to teach you how to make the best of your army. There are two key factors, army composition and conducting your battles. Today we will look at part one, Army Composition. Battles in Team Yankee start with your army selection. This is very important because you should have a plan and then stick to it. How you play is your choice but you should always play to the strengths of your army. Main Battle Tanks (hereafter MBT) are our main offensive weapon. They are the key to breakthrough. For the Soviets the choice is between the sturdy T-64 and T-72. I favour the T-64. A basic unit of T-64 is 13 points for three and the 6 points for each additional tank. For the T-72 it is 12 points for three and then 5 points for every tank. That is not a huge difference and it is not until you buy seven T-64 for 37 points that the T-72 get the extra tank or 8 for the same points. The T-64 has added armour. 17 in front rather than 16. Again apparently a small difference but an important one. The T-64 will bail on a 5+ and save on a 6 against the heavy guns of the Leopard 2 or Chieftain on short range where the T-72 needs a 6 to bail. That is the worst scenario, in all other situations the T-64 is even better, like a 3+ save against the M1 Abram’s main gun at long range. There is another even more important factor and that is the extra 4“/10cm tactical move without penalties. The Soviets usually need a 4+ to hit their enemy and it is important not to add penalties to that roll. Team Yankee is a mobile game and this extra point of armour and movement is very important in the game. Soviets in Team Yankee can field large units, up to 10 tanks but in my experience, you are usually better off with more small units than a few big ones. The first obvious reason is the initial point discount. A T-64 is valued at 6 points per tank, but the first three are at 13 points or a 5 point discount, likewise the T-72 is valued at 5 points, but the initial three are at 12 or a 3 point discount (another reason to go with T-64’s as the discount is higher). Three units of three T-64 come to 39 points, while nine T-64’s cost 49 points. There is another reason as well. Large tank units are unwieldy. 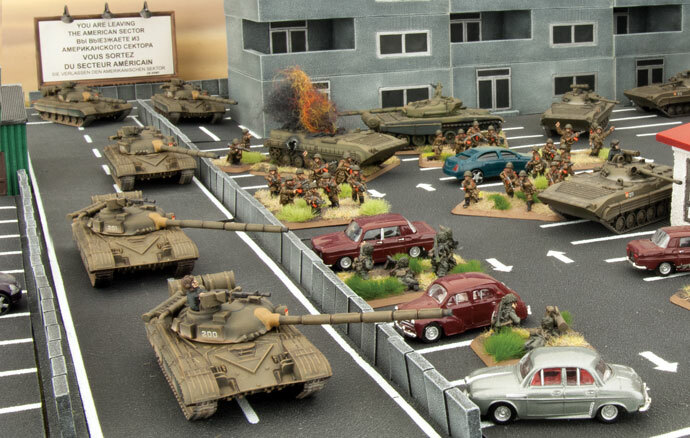 If there is reasonable amount of terrain on the table your tanks will start to be in each other’s way and it is rare to get a good firing solution with all your tanks. NATO tank units are small and they will rarely suffer this problem. They usually fire at full Rate of Fire (ROF) so the large Soviet units might work to their favour. If a West German player can fire three Leopards against only part of your formation and you can only return fire with three to four tanks then ROF will favour the West German. Smaller tank units are in danger of breaking sooner, but this is offset by their high morale and more small units are far more tactically flexible. A larger unit will find it hard to maintain command and bring their full firepower to bear. More numerous smaller units can be at more places at once and are much easier to manoeuvre and can usually fire all their weapons. Only on battlefields with little concealing terrain will large units be at an advantage to more small ones. In Team Yankee tanks are struggling since there are strong counters to tanks, mostly inexpensive missiles in infantry teams and specialised tank hunters. However inglorious it is the infantry is still a battle winner. The Soviet army can have strong formations and make the most of them. A unit with 15 infantry teams has flexibility and staying power. Most teams, even the basic AK-74 team is capable of destroying armoured vehicles. Maybe not the MBT but with AT 14 then everything else is game. They also are firepower 5+ which is important when you need to dig out pesky enemy infantry. A detachment of transports comes with the infantry. These can be BTR-60, BMP-1’s or BMP-2’s. Each suits a different playing style. BTR-60’s and BMP-1’s are considerably cheaper in points while the BMP-2 can take on enemy MBT’s from the front. I have no preference here and leave it to you to decide what suits your style best. It is the infantry itself that is the important formation. They are resilient, 3+ save against attacks. They are best suited to many tasks, attacking enemy strongpoints, securing the battlefield, mine clearing and the list goes on. The skill level of the Soviets may be poor, but the make up for it with good morale and numbers! This is also a strong choice for the Soviets. You can get 2 Krokodil Helicopters, which NATO calls Hinds, is our flying tank. For 5 points, the same as a single T-72. In my opinion a Hind is almost twice as good as a T-72 and you get two for the same points! With Hinds you get a lot. You have a unit that can go anywhere on the battlefield where you need it. They have a good save and can be taken in units of up to 6 Hinds. Their missile is strong enough to penetrate any NATO MBT from the side and is even powerful enough to go against their front armour. They are versatile as well, their machineguns have three shots each and in a full formation that is 18 shots which are excellent against enemy infantry and less armoured vehicles. Do not be afraid of enemy Anti-air. It is not so effective and a strong Hind formation should be able to weather the first storm of counter-defence, see this article. 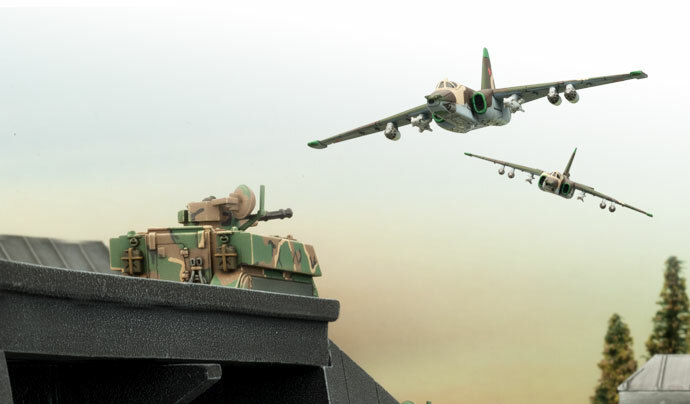 Our Su-25 Frogfoot Aviation Company is also a unit to consider. Slightly more expensive, it can be taken in companies of up to 6 aircraft and has good armour saves. 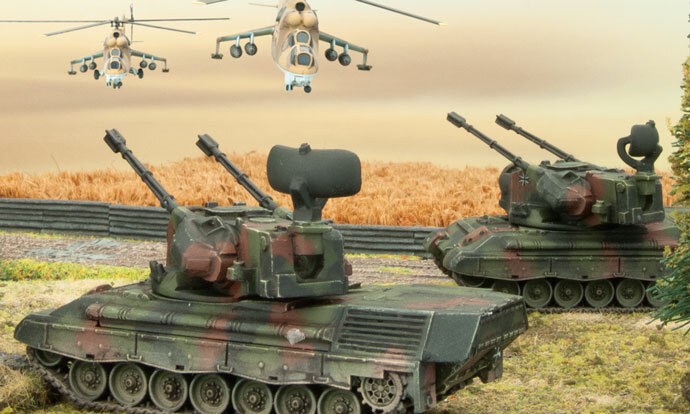 Their Kh-25 air ground missile can destroy any enemy MBT from any angle and they also have powerful machine guns. Their only downside is the 4+ roll to call in air support which is very random. Both the Hind and Frogfoot can fire rocket salvos. I have never seen the use of it. The machine-guns always have more shots and higher firepower. Some enemies may have very strong air defences and in this case you might want to loiter off the battlefield until the rest of your forces have whittled down their defences first. Clearing the way for air support can be a battle winning tactic. 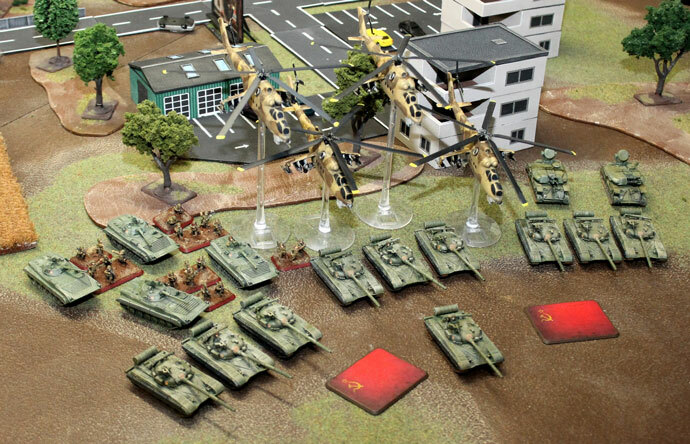 Some Soviet Commanders might like to go all in with air support. Fielding the maximum amount of Hinds and Frogfoot strike aircraft. This is a very potential combination and is especially useful for Afgansty forces. For best effects loiter your Hinds until you roll for the Frogfoot strike. Then overwhelm your enemies Anti-Air. 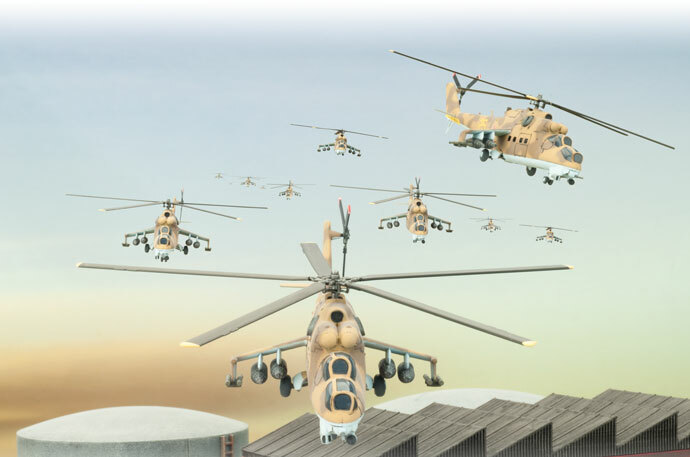 With enough aircraft and helicopters, you should neutralise most of their AA and after you have established air superiority you should be able to strike other parts of the enemy force with impunity. For Anti-air I would say Shilkas should be the first choice, both as a good AA asset and for their versatility. If your enemy has no aircraft, the Shilkas are useful against infantry and weaker armour. For larger battles I would add a little more AA defence and recommend you read the article on counter-air defence above. A small note, often AA looks very good on paper but in reality, they are not very effective so make an informed choice. This is something of a mixed bag for the Soviets as their poor skill level hurts them. Again, in the army lists the artillery looks impressive but usually is harder to manage. It is very hard to hurt enemy MBT and dug in infantry with artillery and they have limited move and fire abilities. Should you take them make sure you have an observer to give you a 4+ chance of ranging in. In my opinion the BM 21 Hails are the best choice. They appear to be less powerful, but the larger salvo template is what makes them very good. Smoke can be useful and funnily since the armour of other artillery is weak, then the unarmoured 5+ save might actually be better. Here is another unit that appears to have potential but usually disappoints. The missiles are o.k. but these usually work better for NATO for two reasons, 1) the Soviets have the poor skill level and this means it is hard to use tactics like Blitz Move and 2) having a base to hit of 3+, then they are most often wiped out in return fire or even before the fire. Still they are cheap in points and can be a good filler in army lists. They might even serve as an area denier against more timid NATO players. Recon is a useful unit. They allow you to widen your deployment with Spearhead. Make sure you understand the Spearhead rule well. Then they are also fast. Do not be tempted to use them in firefights early as they will get destroyed. It is far more useful to move them and threaten to grab an objective and thereby tying up a fair amount of enemy points. 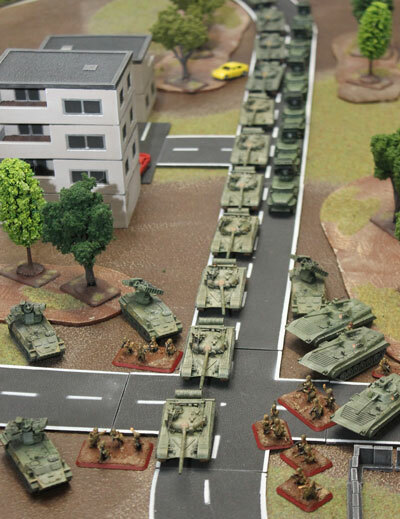 Imagine two M1 Abrams tanks not being able to move because 1 points worth of BRDM-2’s are lurking nearby.